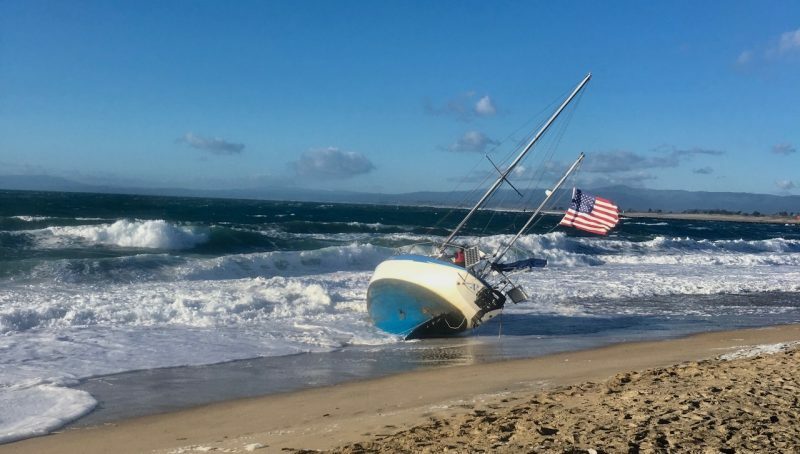 On Friday, “A sailor took his vessel out on a rough day after the rain to ‘dry her out,'” according to Stefan Berlinski, who sails his Santana 22 Hamachi out of Santa Cruz. 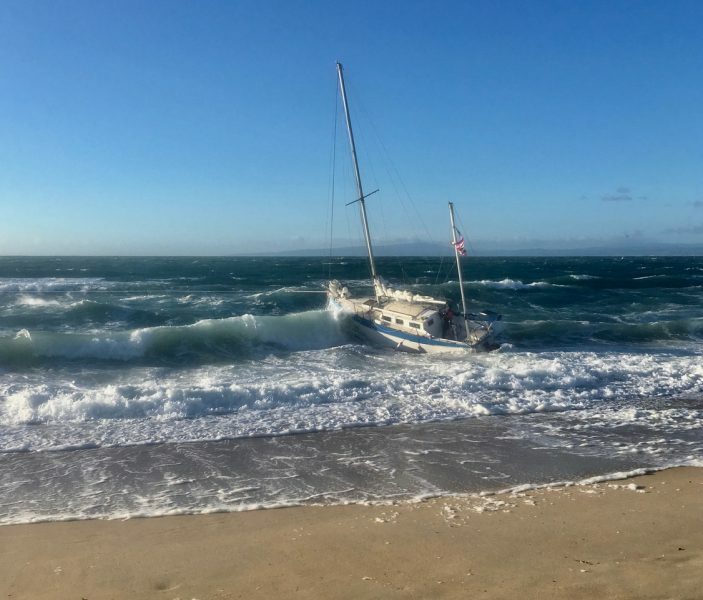 “The gale warnings were reduced to a small craft advisory.” But . . .
“The lifeguards and [people from the] State Park landed a swimmer from TowBoatUS,” Stefan Berlinski wrote us. In Other Unrelated Carnage . . .
Larry Radcliffe spotted this detritus about a third of a mile north of the Santa Fe railroad terminus in Point Richmond. 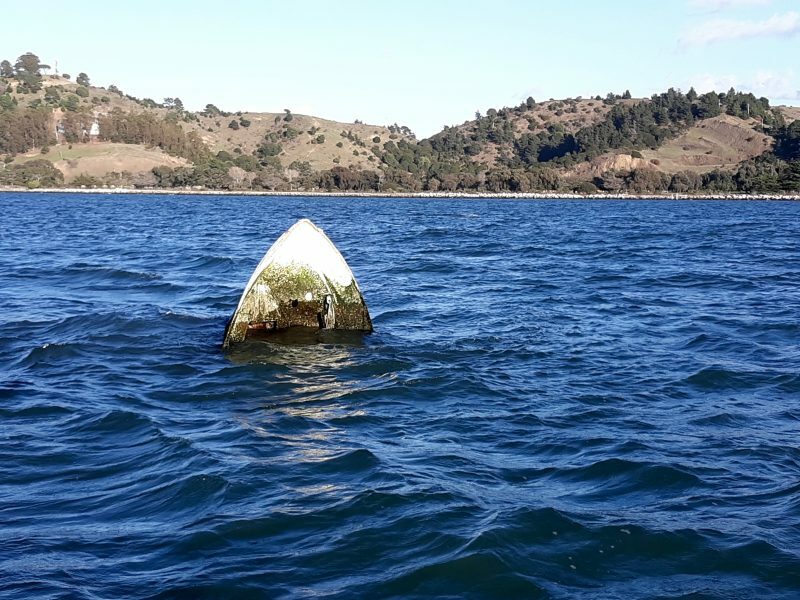 The boat off has apparently been floating near Keller Cove for a long time — since summer at least, according to some of our staff. No, it’s not a whale. It’s a boat. At least, it was a boat. We’re going to do a little forensics here: Given the scummy growth on this boat, it looks like it’s been floating in this position for a while. 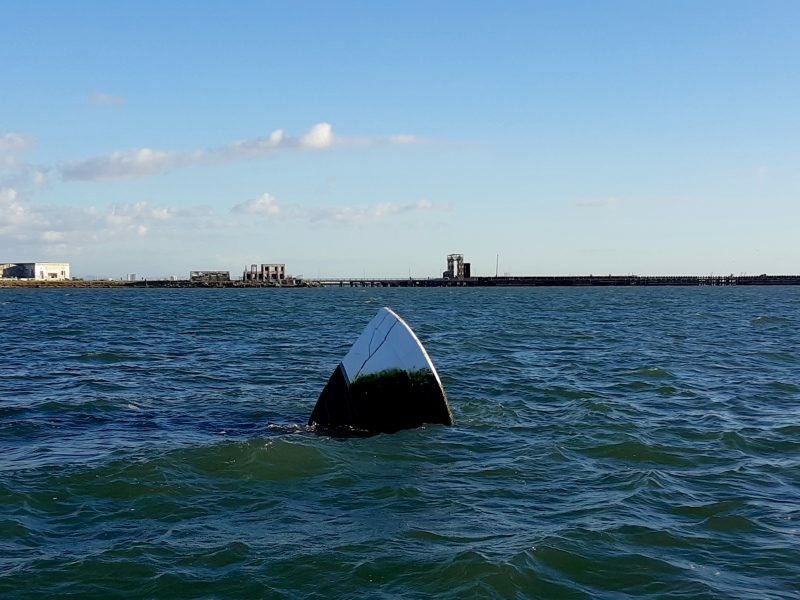 Did you find anything weird beached or floating in the Bay after the rain cleared out? 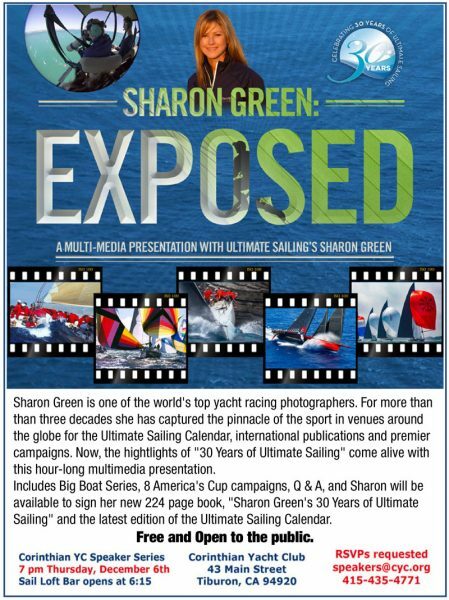 Please comment below, or email us here, and please be sure to include your boat name, make and port of call. 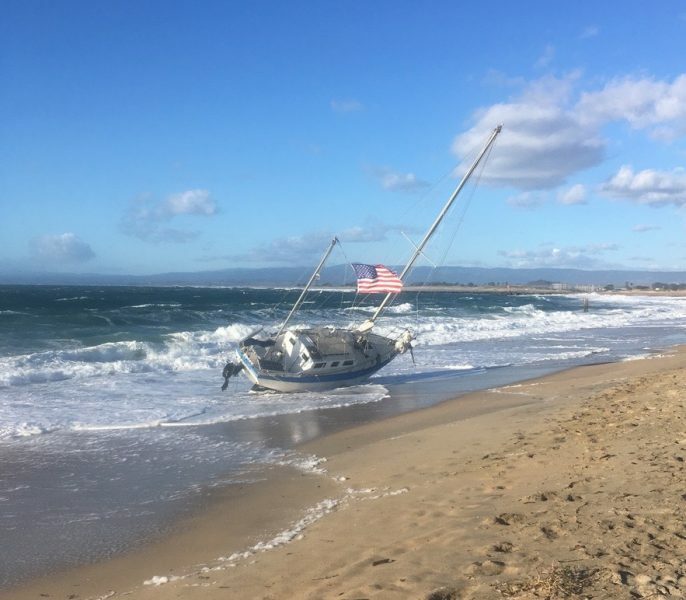 In the wake of a winter storm, a weekend of mixed weather offered a variety of conditions for sailors on Bay Area waters. On Saturday morning, some last rain squalls blew through, leaving rainbows behind. 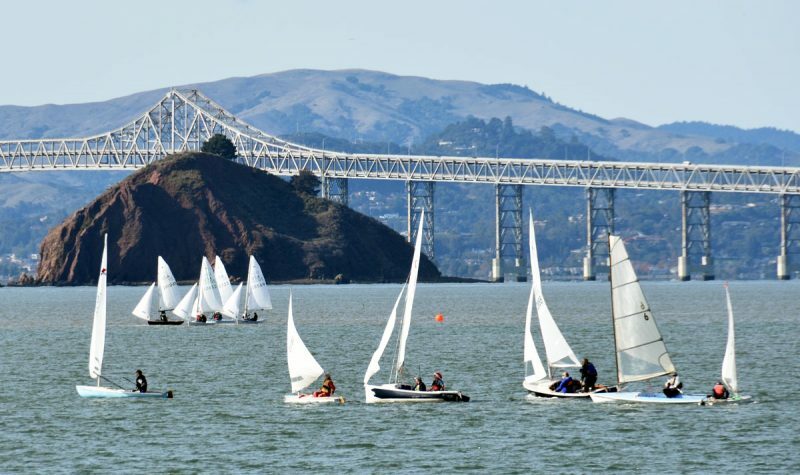 The northwesterly on the Cityfront had already cranked up well before the start time and built through the afternoon, challenging racers in Golden Gate Yacht Club’s Seaweed Soup Series to keep their boats upright. Death-roll oscillations were the norm on the windy dead-downwind run from Harding Rock to Blossom Rock, but all of the boats that made it out to the race course were able to finish. 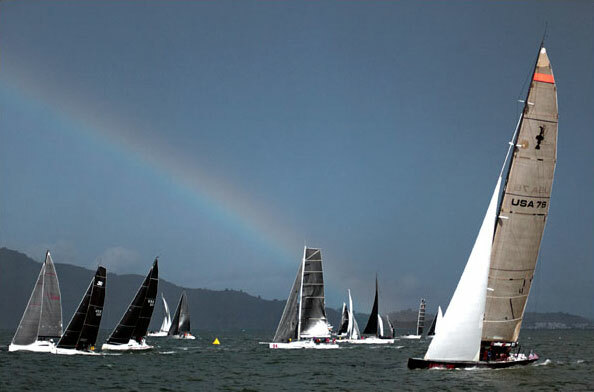 A rainbow graced the starting sequence of Saturday’s GGYC race. Sunday was another story, with bright-blue skies and sunshine that felt warm depending on your particular patch of the Bay. 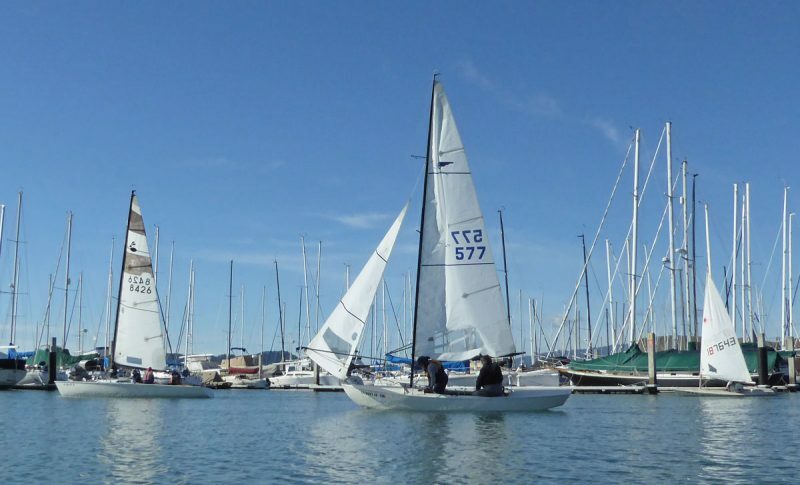 Over by Potrero Point, Richmond YC’s El Toro fleet enjoyed a perfect westerly. The El Toro Seniors prepare to start their second race. The first was abandoned due to a tugboat exiting the Richmond Harbor. Meanwhile, just around the corner, the racers on Keller Cove endured a chilly northerly. A four-boat Snipe fleet begins their downwind leg while an open class of dinghies starts the race. The bigger boats on the Southampton course got in a full day of racing too. 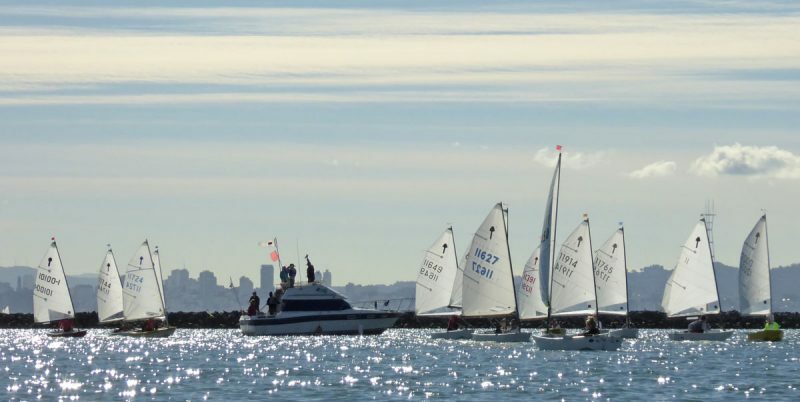 In noontime sunshine, a Wylie Wabbit, a Mercury and a Laser sail out of RYC on their way to the race course. To see a comprehensive list of midwinter series available to racers in the greater Bay Area, check out our Calendar. We’ll have more on this weekend’s midwinters in Racing Sheet in the January issue of Latitude 38, to be published on December 28. 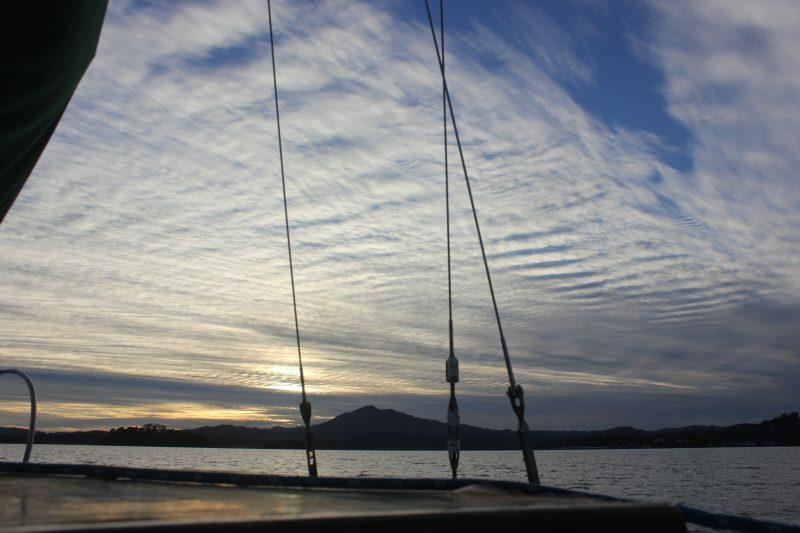 Later in the afternoon, the sun sank behind high clouds, and the breeze in the North Bay shut off. With crisp air and sunset at 4:50 p.m., winter has arrived in the Bay Area. For the fourth time in their eight-year history of competing in the 12-year-old Extreme Sailing Series, Swiss team Alinghi took the title yesterday after a remarkable final Act in Los Cabos, Mexico. 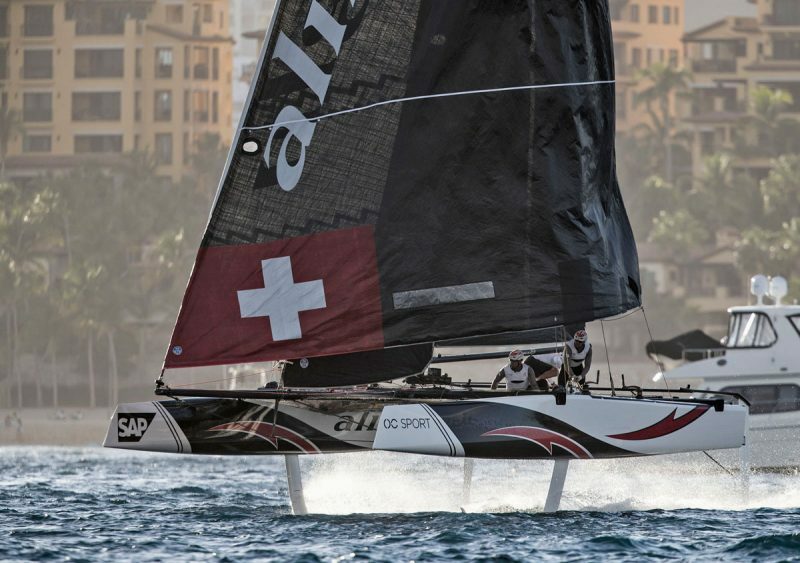 On Saturday, Alinghi climbed up one position from their third-place finish on Friday, to a more favorable second place. Following 10 months of touring around the planet, Ernesto Bertarelli’s Alinghi team closed the grand finale in first place on the double-points Act leaderboard. Their incredible five-out-of-seven Act wins this year cemented them as victors in the overall rankings. And, Alinghi’s shore team won the award for the best shore crew of the season. 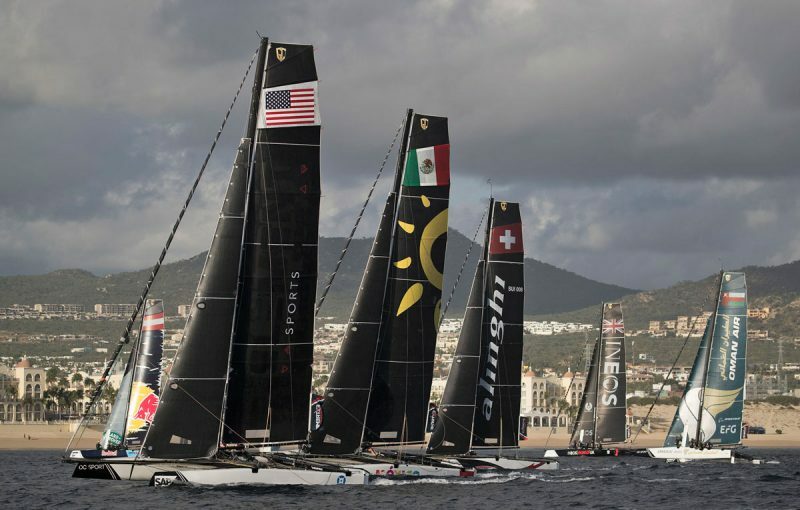 The foiling GC32 catamarans competed in light air off Cabo San Lucas on Saturday. Five teams competed in the spectator-friendly stadium series, with US Team Extreme and Team México joining in the last two Acts. Angeleno Riley Gibbs trimmed the mainsail for US Team Extreme in the final event.